Adem Bunkeddeko, 29, is challenging Brooklyn's Congresswoman Yvette Clarke for her seat in New York's Ninth Congressional District in 2018. CROWN HEIGHTS — For the first time in years, central Brooklyn’s representative in Congress will face a Democratic challenger for reelection. 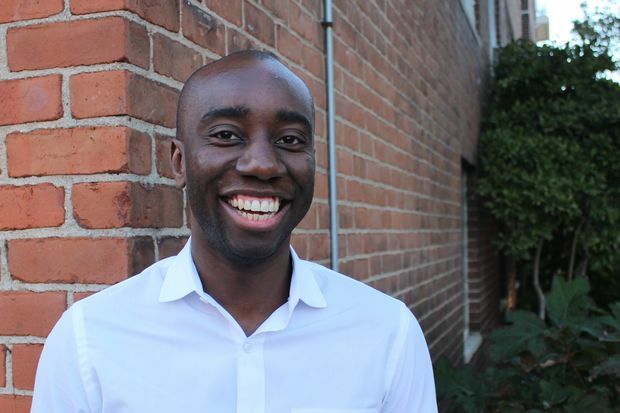 Crown Heights resident Adem Bunkeddeko, 29, kicked off his campaign this week to unseat Rep. Yvette Clarke from the Ninth Congressional District, which she’s represented since 2006. Before her time in Congress, Clarke served on the City Council in Flatbush, following in the footsteps of her mother, Una Clarke, a long-serving councilwoman from the same district. As is common in deep-blue Brooklyn, Rep. Clarke has faced little opposition in election campaigns since taking office 11 years ago. But Bunkeddeko — a Harvard-educated native New Yorker with experience in community organizing and nonprofit work — is hoping to change that in the 2018 election. Born and raised in Queens by parents who fled war-torn Uganda in the 1980s, Bunkeddeko has spent the bulk of his adult life in Brooklyn, working as a political organizer and campaign worker after college. He then had a brief stint in the banking world before moving on to work at the Bedford Stuyvesant Restoration Corporation, the Empire State Development Corporation and most recently Brooklyn Community Services. He is also a member of Brooklyn's Community Board 8. Bunkeddeko got an MBA from Harvard Business School earlier this year and began contemplating a run for Congress. At the start of his 2018 campaign, Bunkeddeko has attracted the backing of longtime Democratic advisor and fundraiser Vernon Jordan and former lieutenant governor and civic booster Richard Ravitch. Bunkeddeko sat down with DNAinfo to talk about his ideas for the district — including new subsidized housing policies and marijuana legalization — and why voters should choose him over a long-serving Democratic incumbent. Why are you running? And why do you think the district needs new leadership? I’ll start off by saying I have great respect for Yvette and for her mother, and I think they’ve done a lot for the community. But the challenges for the community have reached a new inflection point regarding, particularly, housing. But there’s a number of issues: criminal justice, immigration reform, you can go down the list. Many folks are working on a day-to-day basis to try to put food on the table, try to get things done, and we were not hearing much. And as far as I can recall, in the 11 years she’s been there, she has yet to introduce and pass a bill into law, which is — it may be a function of the times, but there are others who are getting things done, even with Republicans in control. So, if you could wave a magic wand to create or change existing federal laws, what would be your top choices? We need to give folks in this community, who built this community, who swept the streets when there weren’t new restaurants and there weren’t all sorts of folks who were looking to come in — they’ve had a stake in this community for so long, they just haven’t had a financial stake. Many of them have rented, and we need to give folks a pathway to ownership. I think low-equity cooperatives for families [earning] between $30,000 and $80,000 is a path forward … It would be a Mitchell Lama-style subsidy in which folks between a certain income bracket can go and be able to purchase a home. The other one is a pathway for citizenship for refugees and DREAMers. As the son of a war refugee, my father — my parents — are eternally grateful for the opportunity to live in the United States. I think they’ve built up a great life. All six of their children went to college. I think stories like that don’t make us weaker as a country; it makes us stronger. And I think the DREAMers and folks who are refugees from all across war-torn countries or disaster-stricken places deserve a shot to live the American dream. And then I think the third piece is criminal justice. We need bail reform, we need sentencing reform and we need to legalize marijuana. And we need to legalize, tax it and regulate it just like alcohol. I think that’s the way forward. After President Trump's inauguration, town halls hosted by Rep. Clarke about resisting his administration were packed with hundreds of constituents. How would you contend with the challenges to progressive ideals, and Democrats in general, in the Trump era? What would you say to voters still upset about the 2016 election? Of course there’s deep anger. For me, that election represented the antithesis of the America I know. As I mentioned to you before, I’m the son of war refugees. Half my family is Muslim, half of it is Christian. We came here with very little, and Mr. Trump’s “We want to make America great again” — it was a dog whistle for a time, which doesn’t seem to really conform with our sense of the country. So, I understand that anger. I feel it deeply. But that anger needs to be taken and put into positive energy which we can [use to] make a change. There are a lot of issues that we’ve been going through as a community that existed long before Mr. Trump arrived on the scene. All he did was amplify it and make it worse... We need to take that anger and we need to channel into improving the lives of folks who have lived on the margins of society for quite some time. You’ve worked as a community organizer and been a politically engaged citizen, but have never held office. What would you tell someone who would say you’re not qualified to be a congressman? I look around and, you know, there are a lot of folks with a lot of political experience, but it hasn’t necessarily produced a lot of results for us. We’re in a time where I think it’s time to really rethink who should be going into public life. I think, at the end of the day, I have a record of accomplishment in the community that I think translates into elected office well. At the end of the day, to me, that record speaks for itself.